US$176,374.10 spent so far out of US$265,301.92 total this year, as of August 31, 2018. 73.9% of the OTW’s expenses go towards maintaining the AO3. This includes the bulk of our server expenses—both new purchases and ongoing colocation and maintenance—website performance monitoring tools and various systems-related licences (access all program expenses). This year, we implemented a significant server overhaul costing about US$115,000. This overhaul focused on new database servers for AO3 works, comments, and activities, as well as a new server rack for them to live on. The new servers also increased our monthly colocation expenses, while the old machines are being repurposed as application servers, which generate the Archive’s pages and serve them to users. Previously, US$100,000 was budgeted for contractor services. However, testing, fixing bugs, and tweaking behavior for our Elasticsearch update took considerably longer than expected, giving us less time than we’d hoped to merge code written by contractors into our code base this year. Therefore, we chose not to contract out any more projects and focus on deploying the code we’d already paid for and that had been submitted by our volunteers. US$5,277.80 spent so far out of US$7,890.77 total this year, as of August 31, 2018. US$2,520.54 spent so far out of US$5,941.53 total this year, as of August 31, 2018. This year, hosting of the TWC issues will be moved offsite to a company that specializes in handling the open source software used by the journal, for an annual cost of US$1,500. There is also US$1,000 budgeted for travel to speak at the 2018 Fan Studies conference. US$540.72 spent so far out of US$1,009.14 total this year, as of August 31, 2018. US$2,670.02 spent so far out of US$2,670.02 total this year, as of August 31, 2018. US$50.00 spent so far out of US$50.00 total this year, as of August 31, 2018. The OTW passed out flyers at the 2018 San Diego Comic Con (access all program expenses). US$13,446.80 spent so far out of US$27,546.80 total this year, as of August 31, 2018. US$39,285.43 spent so far out of US$48,598.58 total this year, as of August 31, 2018. We receive most of our donations each year in the April and October fundraising drives, which together should account for about 73% of our income in 2018. We also receive donations via employer matching programs, royalties, Amazon Smile, and PayPal Giving Fund, which administers donations from programs like Humble Bundle. If you’d like to support us while making purchases on those websites, please select the Organization for Transformative Works as your charity of choice! Given your generosity in previous years, we have a healthy amount in reserves, which we plan to keep in store for a rainy day. Thanks to this, we can explore alternative revenue sources to supplement your donations. The Finance team and the OTW board have decided on a conservative investment portfolio for a small portion of our funds to start with, which will place the initial investment at as low a risk as possible. This move is long overdue, and we’re currently working on creating a solid policy regarding investment and usage of our reserves in place. The reserves also help bolster us in years when we’re planning larger than usual purchases. As mentioned earlier, we have already replaced our old server hardware, and had to withdraw money from reserves to aid in the purchase of servers. However, with the revenue from the rest of the year, which includes the October drive, the net amount used from reserves should be US$30,000. US$213,449.59 received so far (as of August 31, 2018) and US$356,775.34 projected to be received by the end of the year. If you have any questions about the budget or the OTW’s finances, please contact the Finance committee. We will also be hosting an open chat to answer any questions you may have. This chat will take place in our public chatroom on October 15th from 8 to 9PM UTC (what time is that in my timezone?). 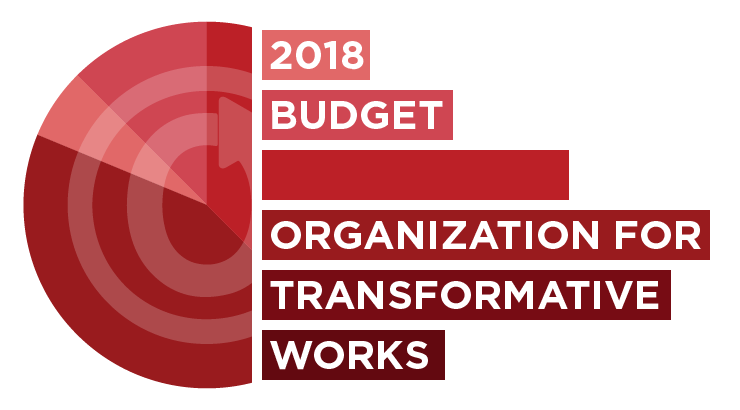 To download the OTW’s updated budget for 2018 in spreadsheet format, please follow this link. Great information! I was interested to see ‘royalties’ as an income source from the books. That’s pretty neat. Wonderful to see my favorite thing in fandom in a healthy position.